Born to a past-his-prime prizefighter, Matt Murdock''s luck always ran a step behind his good intentions. When a daring act to save a man''s life blinds young Murdock, he finds that the same accident has enhanced his remaining senses to superhuman levels! He becomes Daredevil, a gritty hero born from murder but tempered with the desire to protect the downtrodden. 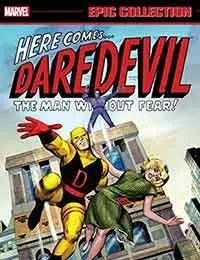 Writer Stan Lee and artists Bill Everett, Joe Orlando, Wallace Wood, John Romita Sr. and Gene Colan lay the foundation of Marvel''s Man Without Fear, including the first appearances of core characters Foggy Nelson and Karen Page — and classic villains like the Owl, the Purple Man, Stilt-Man and the Gladiator!